A collection of Christian Historical Romances – all set in the same town in Kansas, just after the Civil War. 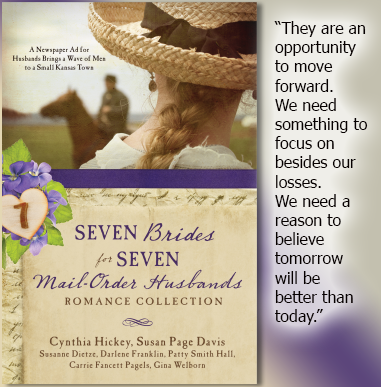 Each of the brides in this series of stories is special. The town was full of women who had lost their men during and after the war. They were strong and had shouldered the work for years, but now they decided it was time to bring in some help. I enjoyed getting to know each of them as well as their prospective husbands. Even though the stories revolve around the advertisement for husbands, not all came in from the ads. I found each one to be interesting and engaging.